COVERS ALL BABY CARRIERS - Front or backpack carrier or hip carrier. 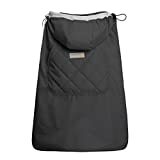 The baby carrier cover is easily to snaps onto any baby carrier. It is also a thick stroller blanket, so use as a stroller winter cover, or nursing cover, or poncho, or blanket. SUITABLE FOR ALL SEASONS - Lightweight fabric and functional ways are the attractive character for you to choose. It can protects your child who is from 0-5 years; keeps baby warm,dry and clean.Sure you and your family will like its convenient. 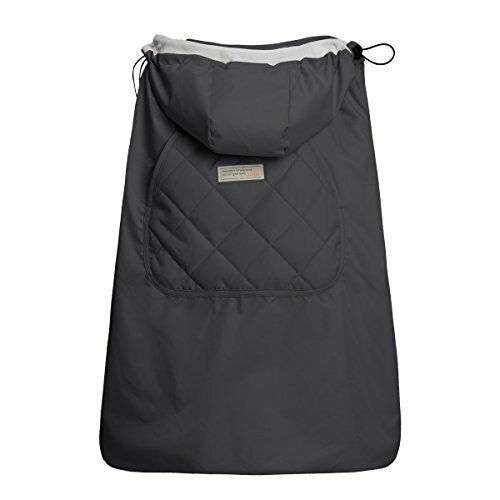 CAREFUL DESIGN - Big convenience pocket keeps parent's hands warm and it's roomy enough to easily keep the daily things such as cell-phones, keys and so on. There are zippers on the right and left of the cover for baby foots, you can close the zippers to give baby warm when the winter day, and open the zipper give baby cool when the hot day. DETACHABLE HAT WITH ZIPPER AND BUCKLE - The head cover can be a hat which will be detachable and reversible. You can use it when you put your baby front or backpack. NO MACHINE WASHING - Please hand washing with mild detergent only,to avoid the product damaged.